Where Do Candidates for Governor Stand on Advanced Energy Growth? In Nine States, AEE is Keeping Score. Last week, AEE took a big step toward localizing and personalizing the advanced energy industry in nine states where we are engaged with the campaigns for governor. On web pages for each of the nine states, we posted profiles of employees of AEE member companies in the state and a scorecard where we show the stances of major-party nominees on the advanced energy policy priorities we shared with the campaigns previously, along with fact sheets on advanced energy jobs in the state. 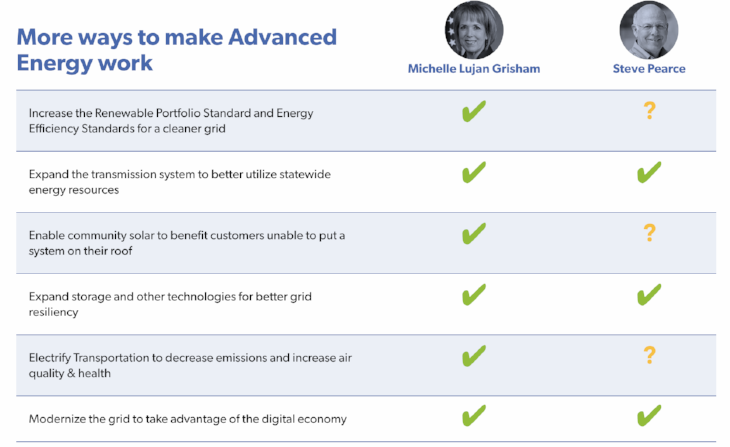 With less than two weeks to go in campaign season, this latest step in AEE’s Gubernatorial Engagement effort provides a voter’s guide for all those who work in advanced energy, or care about the economic opportunity advanced energy represents, with updates based on candidate platforms and public statements right up to Election Day. Tracking and reporting policy positions of candidates is the latest step in a nearly yearlong effort to engage with gubernatorial candidates to discuss the positive economic benefits of advanced energy and offer policy ideas for expanding advanced energy markets in each state. AEE has reached out to every nominee in the nine states for roundtable meetings with member companies, has shared its policy priorities, and released new data on advanced energy jobs. Nationally, the advanced energy industry employs 3.4 million U.S. workers. Coverage of AEE’s candidate scorecards has appeared in the Washington Examiner, Utility Dive, and the Nevada Independent, among other outlets. The project is being supported by targeted digital advertising in the nine states to help voters learn more about the energy policies of gubernatorial hopefuls. Ensuring that candidates for governor appreciate the benefits that advanced energy can bring to their states, namely economic development and good jobs, has been a key focus of AEE this year. We have greatly appreciated the opportunity to meet with many of the nominees from both major parties and their key advisors in these states. We have found the candidates to be receptive to our message and hearing from the companies working in their state. As a result, a bipartisan slate of gubernatorial candidates across the states has adopted at least one of our priority positions. We’re excited to share much of the information we’ve shared with candidates directly with voters so that they can be well informed when they head to the polls. To date, 14 candidates in these nine states have included at least one of AEE’s policy priorities in their energy platforms. Both major party nominees have expressed support for at least one AEE policy in California, Florida, Illinois, New Mexico, and Ohio. In producing its policy roadmaps, AEE identified five or six policy priorities specific to each state, but in general these roadmaps highlighted ways to promote and capitalize on growth in renewable energy, energy efficiency and demand response, battery storage, and electric vehicles – all key advanced energy products and services. Don't miss AEE's upcoming webinar, "Election Preview: Advanced Energy on the Ballot," on Tuesday, October 30, at 1pm ET/10am PT.